One of the most important pieces of your CCW loadout might not be what some would expect. Finding a firearm that is reliable, accurate, easy to carry, and easy to use under stress is paramount. The number two spot on this list is often contested between a good holster and a good belt, the importance of which is difficult to understate. Speaking with someone who carries a firearm regularly, whether for work or for general self defense, will confirm that one of the most important pieces of your CCW loadout is a good belt. A CCW holster has a lot of responsibilities, including being comfortable, effectively concealing the firearm, keeping the firearm in the right position and angle where you put it, and keeping the firearm securely holstered unless and until you intentionally draw it. But what keeps that holster where you put it and allows it to do its job? 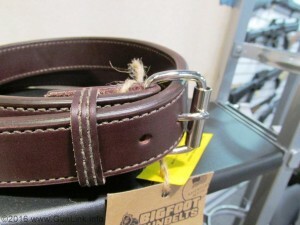 As important as the holster may be, the belt from which you hang it is just as vital. The important thing to realize is that the belt and the holster work together to comprise the overall carry system that you use.